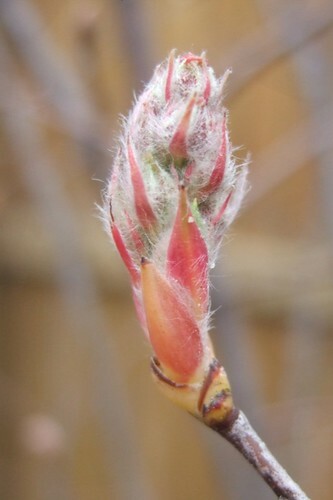 Photo: Bud on an Apple Serviceberry (Amelanchier x grandiflora) tree. 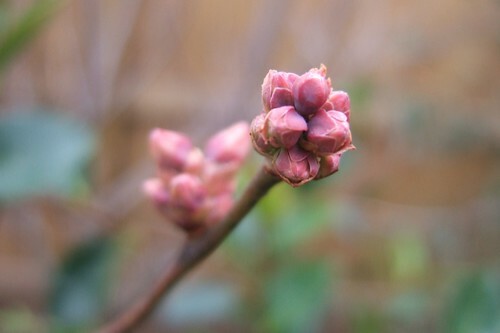 Photo: Buds on a Highbush Blueberry (Vaccinium corymbosum) bush. Our garden is being redesigned. The plants have arrived and are promising great things. I know very little about gardening except I know what I like. Now I have memorized the inventory of our future collection. I greeted the newcomers, still in their burlap root diapers, and asked them to stay awhile. Got a bit whacked out thinking of each tree as a reincarnated person, wondering what the hell happened and who is this woman? I love their names: Cryptomeria…Chamaecyparis…Amelanchier…Osmanthus…Chaenomeles…kings and queens of forgotten civilizations. Or just a bunch of bushes to make my yard look nice. Either way, welcome all to the Dicots and Conifers convention! disfrutes bien! What a joy gardening is! Hey…only thing left to experience is geese! Madam says: I’ve experienced geese.